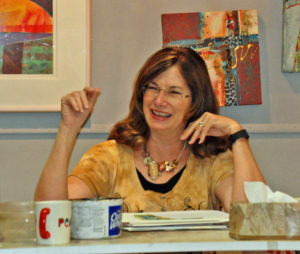 Karen is a highly sought after workshop instructor and an award-winning artist. The workshop with Karen is actually THREE workshops rolled into one exciting weekend! 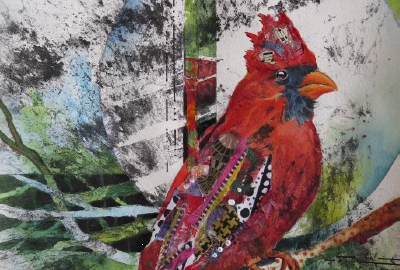 Karen paints in mixed media, trying to make her paintings fun and easy. 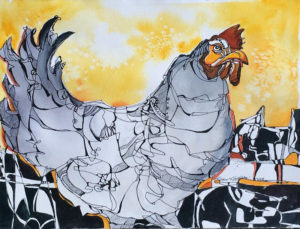 Known for her jazzy colors and semi-abstract designs, she teaches watercolor-and-collage workshops across the country. Her teaching style is playful and relaxed and her explanations are accessible and easy to follow. The workshop will be held over four days. You can purchase a one-day class or all four days. Pricing details can be found in the registration form. If you are a K-12 art teacher and are looking for Continuing Education credit, we are thinking of you! Our 2016 workshop was able to offer 1 unit of Professional Development credit through the UND Extended Learning office. To earn one unit of credit, you will need to attend at least 3 days of Karen’s workshop. The location: Biesot Activities Center on the Dickinson State University campus. Air-conditioned, filled with natural light, and plenty of space! The Badlands Art Association will provide munchies for us to graze on as we stretch our artistic muscles!! More details about the workshops and prices here. You can pay the $100 deposit through PayPal. Follow the link to the Workshop page, or use the PayPal button in the right column. Get Behind the Scenes! Follow Us on Facebook.